In the Sabi Sands adjacent to the Kruger National Park, Singita Boulders Lodge towers over the landscape, a monolith of curving thatch and piled stone that joins seamlessly with the rocky geometry that holds it to the Earth. Senufo artefacts and bold sculpture, offset smooth linen in blue and silent white, as cascading water cools the summer air. Boulders rests on the banks of the Sand River in the heart of the Singita Private Game Reserve, unlocking the senses to views that stretch to the edges of the imagination. Singita Boulder's suites feature magnificent stone bathrooms and bedrooms that encapsulate in luxury. Quiet, simple and luxurious, moments spent on the vast sundecks will leave you at the mercy of the breathtaking wild distance. Singita Boulders Lodge both comprise twelve double suites, all with own en suite bathroom and shower, outside shower, private swimming pool, double-sided fireplace, mini bar and fridge, room mini safe, airconditioning, overhead fans, private lounge, direct dial telephones and game-viewing deck. Lounge and timber-deck dining areas overlooking the Sand River, bar area and open boma, gymnasium, health spa, library, wine cellar and swimming pools. Early morning game drives; afternoon into spotlit evening game drives in open Land Rovers; guided bush walks, seasonal fishing and community tours. Leopard, lion, elephant, buffalo, white rhino, cheetah, hyena, giraffe, zebra, waterbuck, hippo, wildebeest, kudu and many other mammal and bird species occur. bathrooms, indoor and outdoor showers and private wooden leisure decks. boma, wooden dining deck or indoor dining area. Two open Land Rover safaris per day accompanied by personal game ranger and tracker team. Walking and spotlit night safaris, accompanied by experienced trackers. Drinks while on the Land Rover safaris. All beers, spirits, liqueurs, wines, soft drinks and mini bar. Telephone calls and boutique purchases. Transfers to and from the lodges. Use of private Land Rover. 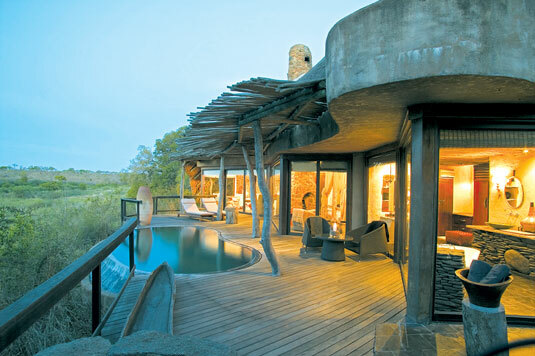 Exclusive use of family suites at Ebony and Boulders Lodges. We regret that no triples or children under the age of 10 years can be accommodated at Singita Lodges . Exceptions can be made for younger children if the Family Suites at Singita Ebony or Boulders are booked for exclusive use – and if any of the other lodges are fully booked by a single party. For safety reasons we cannot accept children of younger than six years at any of the lodges.